The three burner, 51000 BTU G3000 Propane Gas Grill by TEC may be better than anything you have in your own kitchen. Fundamental problems most chefs have come to see as normal have been engineered out of this top quality machine, and the simple things like wood smoke have been re-introduced. Hot and cold spots on a gas grill are fairly normal, with some companies doing a little better than others and the greatest burden resting on the operator's shoulders. TEC's infrared technology takes the guesswork out of the burner settings, relying on special burners to evenly distribute the heat. Instead of directly heating the food, the burners heat a radiant layer beneath the cooking grid. That eliminates air flow problems and resulting flare-ups. Drippings fall on the radiating panel and are converted to flavorful smoke. Infrared heat, not hot air, cooks the food without the drying and loss of flavor common to other designs. 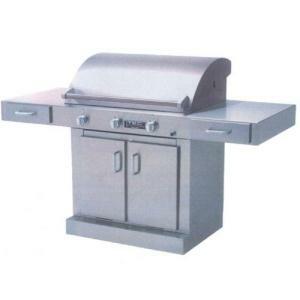 The entire cabinet of this grill is heavy grade stainless steel, easy to clean and resistant to weather and impact damage. Many accessories are available, including cabinets that fit under the already spacious end tables. Steamers, woks, griddles, and deep fryers can all be added, as well as a motorized rotissierie with a weight capacity of sixty pounds. It's even possible to add wood chips directly to the heating panels for that special mesquite, hickory or applewood taste. The warranty is as tough as the grill, with lifetime coverage for the exterior, a generous five years on the burners, and one year on minor parts.